I always love it when Papercut Patterns release a new collection, even though it means I have to immediately re-arrange my entire sewing list to accommodate the new patterns that jump to the top of my queue! This time I was lucky to get a sneak peek of the patterns- I responded to an Instagram tester call, and made up the Sierra Jumpsuit. It’s a super cool pattern, but that’s not what I’m posting about today! 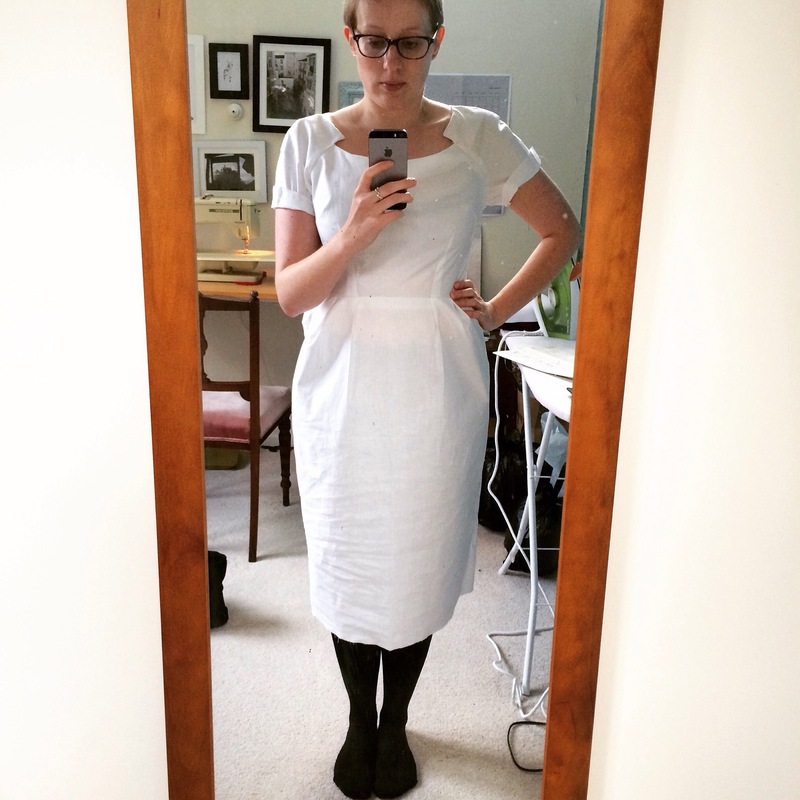 I haven’t moved past the muslin stage with the jumpsuit yet, but once the collection was released I nabbed myself a copy of the beautiful Meridian Dress and immediately sewed it up for my upcoming work Christmas party. The dress came together really easily, but has some clever techniques and drafting to make the front wrap portions of the dress. I did have a bit of trouble figuring out how to shorten the bodice, as the front pattern piece is a pretty weird shape, and I probably didn’t do the best job, but when it’s all wrapped up it’s hard to tell if there’s anything amiss! I considered using french seams to sew this up, but in the end I just went with overlocking them and pressing them open. I wouldn’t have been able to use a french seam for the centre front or back seams, so I figured I might as well treat them all the same! I did the hems with a blind hem stitch on my machine, I love that finish. I think the back is just as pretty as the front! The invisible zipper finished half way up the back bodice, leaving a keyhole and button and loop to close the top of the dress. I used a small fabric covered button, and I think it’s turned out pretty cute! I really like the length of the ties as well, they’re really well proportioned with the length of the skirt. The pleats on the front and back skirt help to give it enough wearing ease and swishy-ness to be comfortable, but the skirt still feels slim and modern to me. 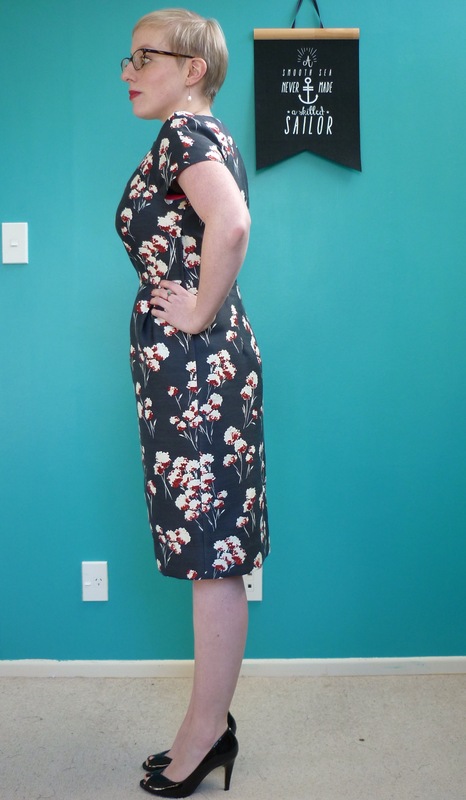 Before I saw the patterns I had bought myself a length of this gorgeous Atelier Brunette viscose pique from Miss Maude Fabrics, and once I saw the patterns I knew it would be a perfect match for the Meridian dress! It was lovely to sew with, it’s really light and floaty but also fairly stable. It didn’t seem to want to slip off the table or out from under my pins like some silky fabrics do! I do wonder if it camouflages the details of the pattern a bit though, the wrap front and the pleats in the skirt aren’t as obvious as they would be in a smaller print or a plain fabric. And I’ve only just noticed that I’ve cut the front skirt piece upside down to the rest of the pieces, I didn’t think the print was directional but those big pale pink loopy flowers are definitely up the other way on the rest of the dress! I’ve been playing around with different ways to wear the wrap front, the top picture is just wrapped around my waist as shown in the sample photos, but the second picture is the ties knotted together in the front and then tied in the back. I really like the second way as well, it’s hard to tell in the photos but it gives the bodice a slightly looser, more blousy fit and changes the overall silhouette of the dress. 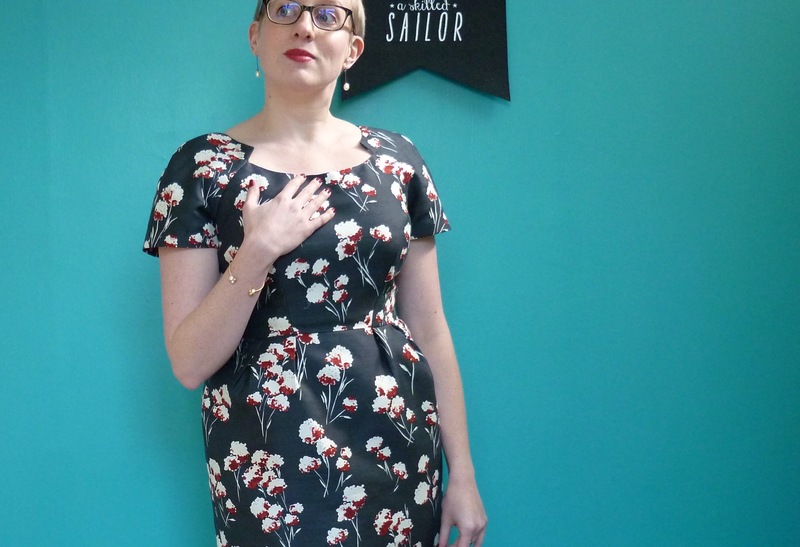 I’ve finally finished the second part of my Vintage Pattern Pledge, a party dress made from a vintage Simplicity pattern which I found at a local vintage store. 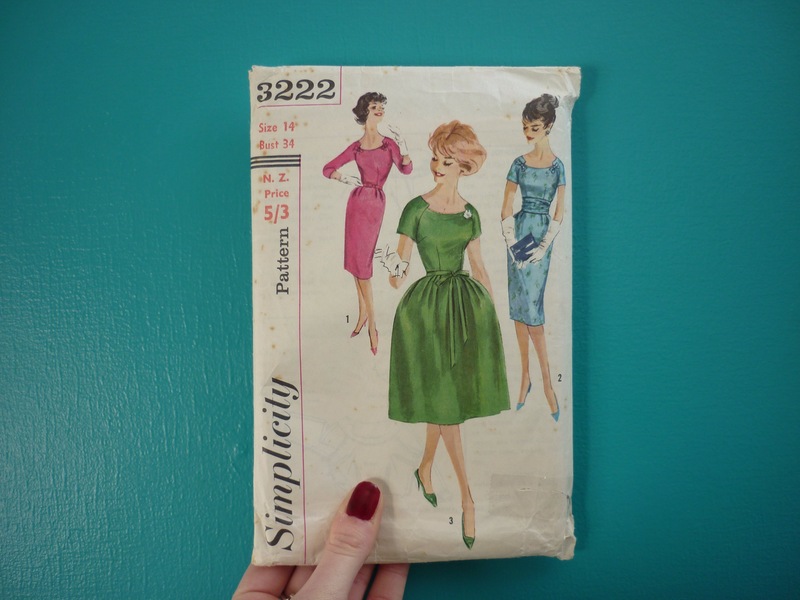 I was sure it was an early 1960’s pattern ( I looked it up when I bought it, and was sure it was 1961 or 62), but I’ve just checked the vintage pattern wiki and they have it down as being first released in 1959. I’m still going to call it a 1960’s drss though, as the pattern wouldn’t have made it to New Zealand until then! I then made up another muslin, and decided it was pretty good! The bodice fitted surprisingly well across the bust and shoulders, considering I made no changes there other than taking that small wedge out of the back neckline to combat gaping. The darts are perhaps not pointing in exactly the right place, but they’re ok. Finally I took a deep breath and cut into this much adored length of fabric. I’ve tried to match this fabric to several patterns since I bought it from The Fabric Store last year, its caused me some grief! Originally I wanted to make a Republic Du Chiffon Madeleine dress out of it, but when I tried to gather a scrap of it it just bunched and looked terrible. Its a silk/wool blend from Tory Burch, and is reasonably hefty with quite a stiff hand. I’m glad I decided to go with somethng more structured rather than persevering with my original plan! I did have a wee bit of trouble with two parts in the instructions, the lapped zip and the vent. I had to pull out my Readers Digest Sewing Guide for the zip, and I just did my own thing for the vent! I really struggled to get the side lapped zip in neatly (you can see it in the side seam above), so I ended up hand picking it. The overlap is probably too wide, next time I’ll try to make it a bit more narrow and subtle. 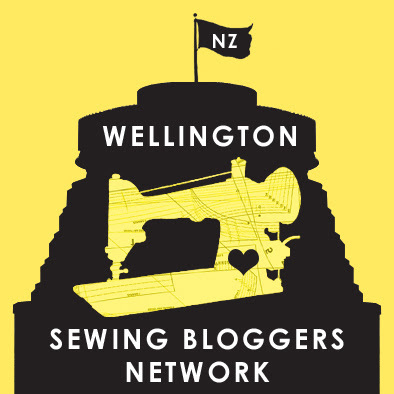 I was a bit worried that my hand stitching wouldn’t be as strong either, but it held up ok! I must say, I was rather surprised by just how shapely this dress makes me look! Got to love a wiggle dress. My trouble with the vent stemmed from my decision to line the whole dress, and I didn’t think to look up how to modify the shape of the vent for the lining (the pattern is unlined). But the time I realised I was going to have trouble, it was too late for me to change what I had done, so I just fudged it. Not the most perfect piece of sewing I’ve ever done, but it’ll do! I used some deep red bias tape to finish the hem of the skirt and sleeves. I love the flash of bright colour that you can see inside the sleeves sometimes! 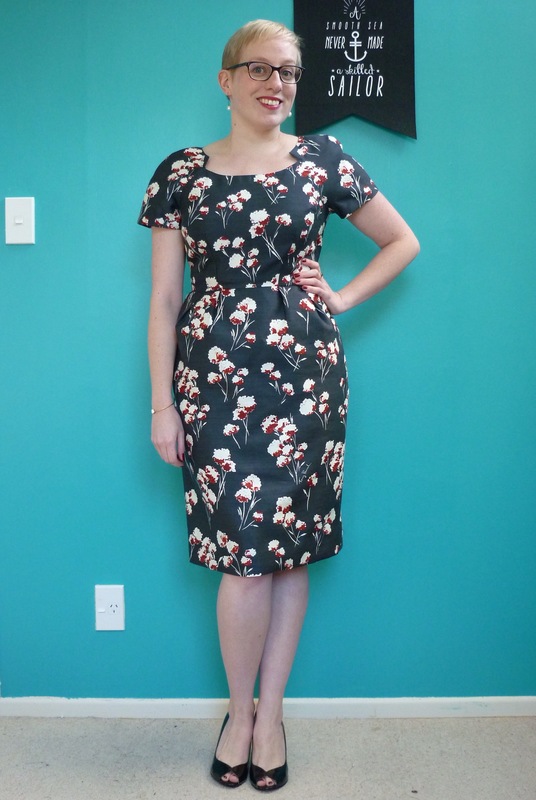 The best part of this dress is the shape of the upper bodice though. The sleeves are two piece raglan sleeves, and they’re so beautifully shaped, while the neckline is so pretty! Something I really noticed while making this was how it seemed to be designed to fit on a real, 3D form. I would have had huge trouble pressing the bodice without the assisance of a tailors ham, and pinning and pressing the neckline facing would have been a nightmare without it! So often modern patterns seem to be made up of flat shapes, this was a very different fitting and sewing experience. I used silk organza to interface the whole facing, and then added an extra layer at the front raglan edges to try and keep those points flat. It worked surprisingly well, the points only rolled outwards if there was downward tension on the lining, which was eay to fix with a few stitches through the facing at the raglan seams! This dress has been a total labour of love, I don’t think I’ve ever put so much effort into a dress before! I’m glad I did though, I would have been gutted if I had done anything less with this fabric. 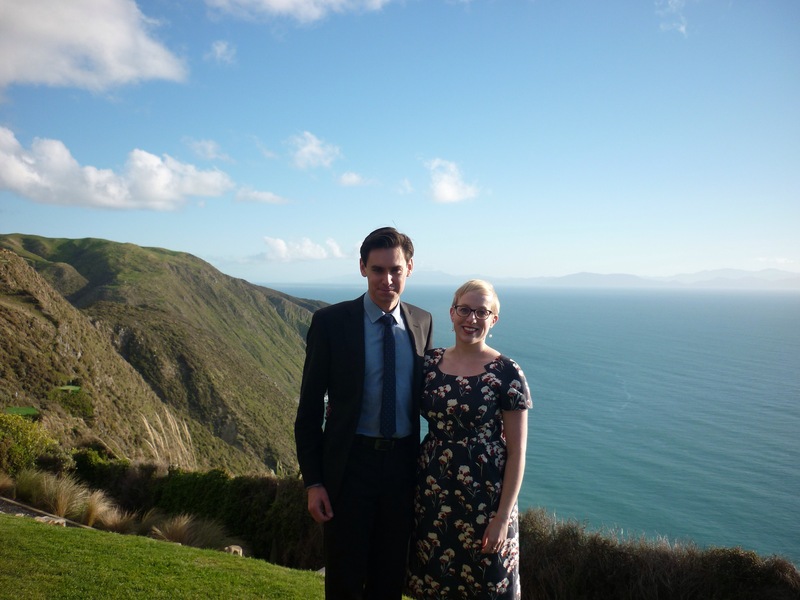 I wore it to the wedding of some of our good friends yesterday, and had the most lovely day. The weather was perfect, sunny and crisp (and no wind! ), and the location was absolutely stunning, and it was just a beautiful, happy day!